Grand Retrieving Trial Champion Reveirter Jet Kite Tike was born on 1 January 1997 and retired from trialling on 3 November 2008 at the Tasmanian Retrieving Trial Championship just two months short of the age of twelve. Tike was proudly trialled by Kate and Noel Eltringham and handled by Noel. From an early age his desire to retrieve could not be questioned, but his future as a trial dog really remained in doubt until he got to Restricted level. Tike was a dog who would never give up and did his utmost to please. He was a great finder of birds to be retrieved and completed trials with great regularity. Whenever he went to the firing point you had great confidence that he would complete the trial. At one stage of his trialling career, Tike went 20 months from 19 August 2006 to 26 April 2008 (at the age of 11) without missing a bird in a trial. During this period, Tike completed 26 All Age Stakes and 9 Championship Stakes. In another 16 month period from January 2005 to April 2006 Tike competed in 33 trails and there was only one time that he failed to finish. Tike commenced his trial career on 15 March 1998. At his first two Novice Trials, Tike failed to complete the event. After competing in five Novice Stakes, Tike gained his Novice Retrieving Dog title, winning a Restricted Stake at his sixth start in a retrieving trial. Tike’s Restricted career lasted a little longer, competing in 11 Restricted Stakes. Tike eventually won three Restricted Stakes, his last on 17 April 1999, and he placed second four times from the 11 starts. Tike’s All Age career started just over a week later on 25 April 1999, where he placed second on his first start getting beaten by two points. This was to be the start of a long and successful career in All Age and Championship Stakes. Tike’s first All Age win was on 30 October 1999 at the age of 2 years 10 months. The following day, Tike got second in the Tasmanian State Championship to give him his Retrieving Trial Champion title in the one weekend. As irony would have it, the dog to beat him in the Tasmanian Championship was his dam “Tess”, Rt Ch Firefield Yankee Belle CM. In total, Tike competed in 170 All Age Stakes for 105 placings, comprising 46 wins, 42 seconds and 17 thirds. Tike’s career in Championship Stakes was almost equally successful. At Tike’s second start in a Championship in the West Australian State Championship on 21 August 1999, at the age of 2 years 8 months, Tike got third place against 44 dogs competing. The following week, Tike came fourth in his first National Championship against 45 dogs. Tike went on to place 25 times out of 44 starts in Championships. This included four wins in State Championships and five seconds. Tike placed in five National Championships. Tike gained the title of Grand Retrieving Trial Champion on 17 April 2005, becoming the first dog in Australia to qualify for this award. Tike eventually went on to accumulate 354 championship points in All Age and Championship trials. The main issue that brought Tike’s retrieving trial career to an end was a gradual loss of hearing. Tike finished his trialling career by completing two championship stakes in his last two events, gaining a fourth in the Victorian State Championship in his second last trial in October 2008. Tike also won the Victorian Canine Association Retrieving Trial Dog of the Year three times and won the Victorian Gundog Club Retrieving Trial Dog of the Year five times. 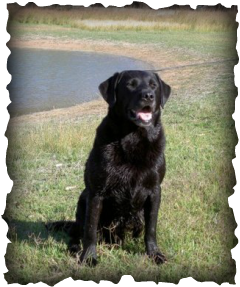 In addition to Tike having an outstanding and lengthy career in retrieving trials, his qualities are now being passed on to his descendants who are currently competing in retrieving trials across Australia. Tike sadly passed away on 21 February 2011.